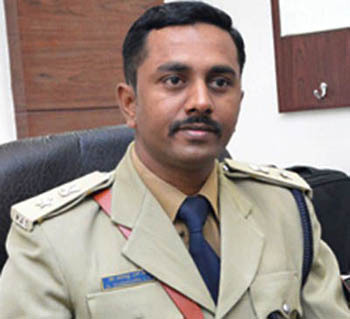 Mangaluru, Nov 01, 2015: Speaking on ‘Career options in civil services and the role of the media’ on Oct 31, Saturday, Superintendent of Police, Dakshina Kannada, Sharanappa S.D., has said that Indian Civil Services provide an opportunity to serve people and bring development in the nation and mitigate ills. Youngsters should not be discouraged from pursuing it as a career option. He also said that with intelligent planning and a systematic approach, students could easily crack the Union Public Services examination. The background, political connection or being the son of a civil servant will not matter. It all depends on you and you alone. The talk was organised jointly by the Literature Club of Alva’s Institute of Engineering and Technology and The Hindu . Reading newspapers and other printed matter, SP Sharanappa said, was an important part of the preparation for civil services and other competitive examinations. Apart from giving an understanding on the incidents in society, it helps one improve language proficiency. He recalled the way he spent several hours reading newspapers and magazines and preparing notes for general studies and current affairs. Sp Sharanappa said students should analyse their strengths and weaknesses and pursue a career for which they need to go beyond the cool comforts of family. Be outspoken and outreaching so that your dreams expand and take off. He said and referred to the efforts put in by the former President A.P.J Abdul Kalam. It was with his consistent perseverance that Kalam reached the pinnacles of the world. The SP, Sharanappa asked students to think of themselves and realise their potential. He asked them to take the right decision at the right time and join the civil services if they were suited to it.